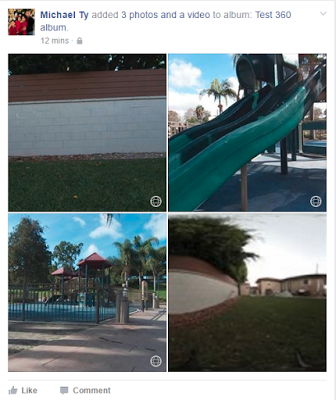 You can now create Facebook albums with more than one 360 photo or video, and they will each be presented in 360. Previously, you could upload 360 photos or videos to Facebook but you had to do it one at a time by posting to your timeline. If you posted more than one 360 photo in an album, only one of them would be displayed as 360 while the others would be shown as an equirectangular photo. Now, you can upload several 360 photos or videos to an album and they can each be shown in 360. Simply create an album and add photos or videos to it as you normally would. If any of them are 360, they should be recognized as such. This is much more convenient than uploading 360 photos one at a time to your timeline, besides seeming like you are spamming your friends. Facebook has been very proactive in supporting 360 photos and videos. Recently, they also announced 360 Live, which will enable 360 livestreaming, and which will be rolled out to all Pages and Profiles in 2017. My 360 photo was published in a calendar!